Could you be a cycling instructor? Kent County Council is looking to recruit more cycling instructors on a part-time, casual basis. To be a cycle instructor, you have to attend a four day training course and be an experienced and confident cyclist. The next four-day course starts in September (18,19, 25 and 26) in Ashford and covers all aspects of the National Standard Cycle training. More information is available at www.kent.gov.uk/cycletraining. Help needed to Captain a tandem! Keith Pascoe of Herne Bay, who is registered blind, is very keen get on his tandem but needs a captain. If there are any members or fellow cyclists in the area who can help, please contact him on keithpascoe2010@gmail.com. The next Spokes monthly ride will be on Sunday September 3. The ride will explore the orchards and hop fields around Perry Wood and the leader Andrew Wyvers. Meet at Faversham station at 10.30. A member in Whitstable recommends this book to Spokes members - A Victorian Cyclist: rambling through Kent in 1886 by Stephen & Shirley Channing. The book is published by Ozaru Books, St Nicholas-at-Wade (200 illustrations). Bicycles are so much a part of everyday life nowadays, it can be surprising to realize that for the late Victorians these "velocipedes" were a novelty disparaged as being unhealthy and unsafe – and that indeed tricycles were for a time seen as the format more likely to succeed. Some people however adopted the new-fangled devices with alacrity, embarking on adventurous tours throughout the countryside. One of them documented his 'rambles' around East Kent in such detail that it is still possible to follow his routes on modern cycles, and compare the fauna and flora (and pubs!) with those he vividly described. 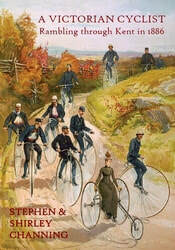 In addition to providing today's cyclists with new historical routes to explore, and both naturalists and social historians with plenty of material for research, this fascinating book contains a special chapter on lady cyclists in the era before female emancipation, and an unintentionally humorous section instructing young gentlemen how to make their cycle and then ride it.